Justice Scalia was honored yesterday for 25 years on the Supreme Court. But his judicial career started four years before his elevation to the Supreme Court. 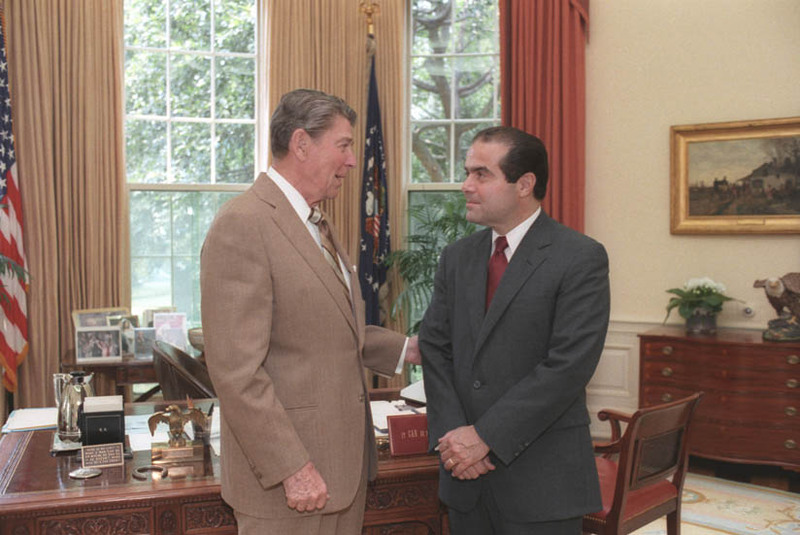 President Ronald Reagan nominated Professor Antonin Scalia to the D.C. Circuit on July 15, 1982. He was confirmed by the Senate (98-0) on August 5, 1982, and sworn into office on August 17, 1982. In retrospect, it is no surprise that the Great Dissenter‘s first published opinion was a dissent from the denial of rehearing en banc. Washington Post Co. v. U.S. Dept. of State, 685 F.2d 698, 707 (D.C. Cir. 1982), vacated, 104 S.Ct. 418 (1983). The panel opinion had held, before Scalia even joined the Court, that Exemption 3 of the Freedom of Information Act (“FOIA”) did not protect the State Department from the Washington Post’s request for certain financial records, and that subsequent legislation had failed to bring them within the Exemption’s protection. In two short pages of classic Scalia dissent, the novice jurist argued that a more recent statute, which imposed “the most detailed limitations” on the release of the relevant records, had effectively removed the records from FOIA’s general presumption of access. Judge Scalia lambasted the panel opinion for its reliance on “legislative history alone” and for its “perverse result.” Id. For his part, Scalia relied on “traditional canons of interpretation” and on the “congressionally approved tradition and practice of confidentiality in foreign affairs matters.” Id. He expressed a now-familiar concern for “the development of a coherent body of law,” and even hinted that deference to the Executive Branch’s statutory interpretation might be in order. (“The language of Exemption 3 would certainly bear the interpretation the Government urged.”). Id. Judge Scalia seems to have arrived at the D.C. Circuit with his enduring judicial philosophy already fully formed. Judge Scalia left the D.C. Circuit in September 1986 to become the 103rd Associate Justice of the United States Supreme Court. Yesterday, Chief Justice Roberts quipped, “[t]he place has not been the same since.” Neither place has.